Have a marvelous week end ! and see you next time for my zigzagy blanket 100% done:) Hurray!! 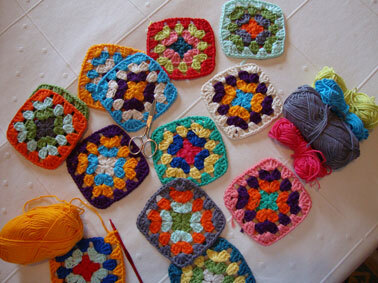 The granny squares look so cute! And I LOVE the bucket! Your granny squares are exceptionally sweet! I’m at the stage where I want to crochet anything and everything and have the injuries to prove it! 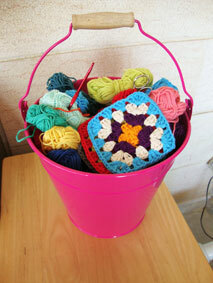 lovely, lovely, why limit yourself to one crochet project! 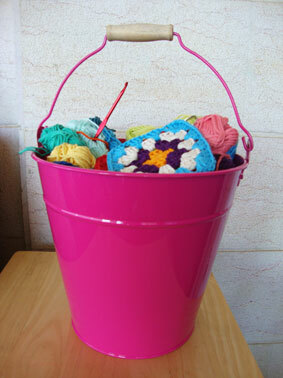 The squares are lovely and bright; the bucket is genius. Love it! I love that bucket! and the squares are so colorful and beautiful! Gorgeous squares! I really love the way you’ve used so many colours in them. Very inspiring! Thanks for posting the pic on my blog. I just discovered your blog – so much eye candy – I love it all. 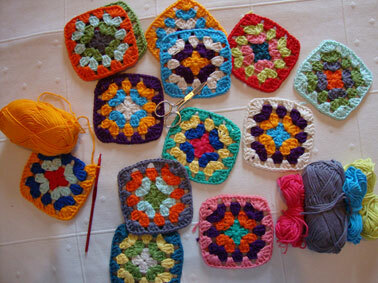 I especially love the flower afghan squares – now if only I could figure out the crochet symbol chart. This is new to me but hopefully I will work through it!! Your work is fantastic.